Download "NOTE: The home screen always displays the day and month, time, & P1 (Partition 1)"
2 NOTE: The home screen always displays the day and month, time, & P1 (Partition 1) STAY AWAY DISARM The Asterisk key on your user interface pad is the most commonly used key. This is your SYSTEM STATUS; it tells you what is going on with the system. IS YOUR SYSTEM BEEPING? : Is your system beeping??? Hit the * button, the system needs you to acknowledge it before it will stop beeping. Does your keypad beep 5 times in a row??? Hit the * button to acknowledge it and it will tell you WHY it s beeping. 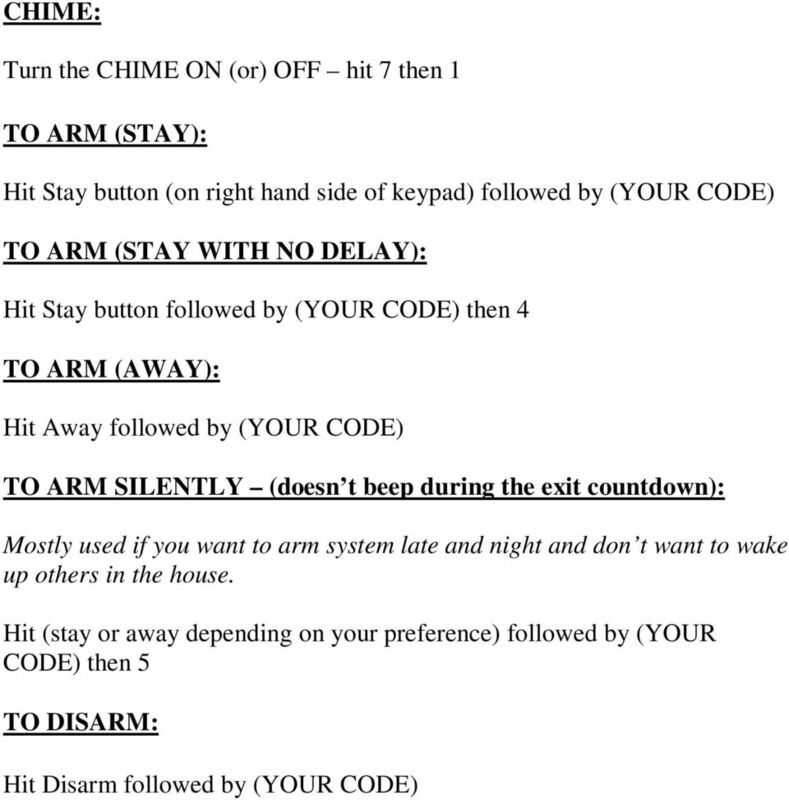 o Then hit the Disarm button (on the right hand side of the keypad), followed by (YOUR CODE). 3 DO YOU HAVE HARDWIRED SMOKES??? HOW DO YOU KNOW IF YOURS ARE HARDWIRED OR WIRELESS? WELL IF YOU PULL THE SMOKE DOWN DOES IT HAVE WIRES? (IF SO, IT S HARDWIRED) IF THERE ARE NO WIRES, IT S WIRELESS. IN MOST CASES, THEY BOTH HAVE BATTERIES AS BACK UP. *** VERY IMPORTANT: THE ELECTRICIANS 110VAC SMOKE & C02 COMBINATION DETECTORS ARE NOT OURS AND HAVE NO CONNECTION WHAT SO EVER TO OUR EQUIPMENT. MOST ELECTRICIAN SMOKE AND C02 COMBOS ARE MADE BY KIDDE OR FIRST ALERT ; THEREFORE, IF YOU SEE THAT ON THE DETECTOR IT IS NOT OURS. 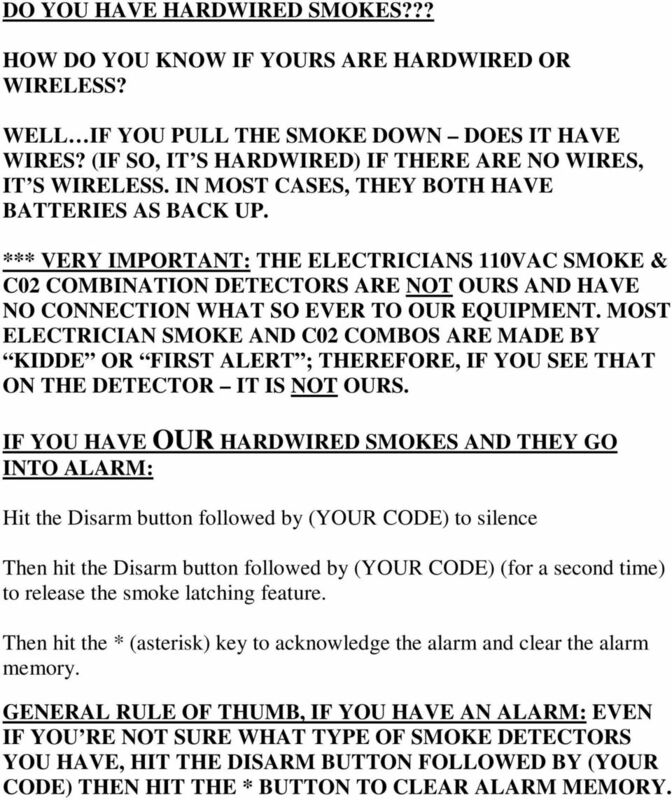 IF YOU HAVE OUR HARDWIRED SMOKES AND THEY GO INTO ALARM: Hit the Disarm button followed by (YOUR CODE) to silence Then hit the Disarm button followed by (YOUR CODE) (for a second time) to release the smoke latching feature. Then hit the * (asterisk) key to acknowledge the alarm and clear the alarm memory. GENERAL RULE OF THUMB, IF YOU HAVE AN ALARM: EVEN IF YOU RE NOT SURE WHAT TYPE OF SMOKE DETECTORS YOU HAVE, HIT THE DISARM BUTTON FOLLOWED BY (YOUR CODE) THEN HIT THE * BUTTON TO CLEAR ALARM MEMORY. 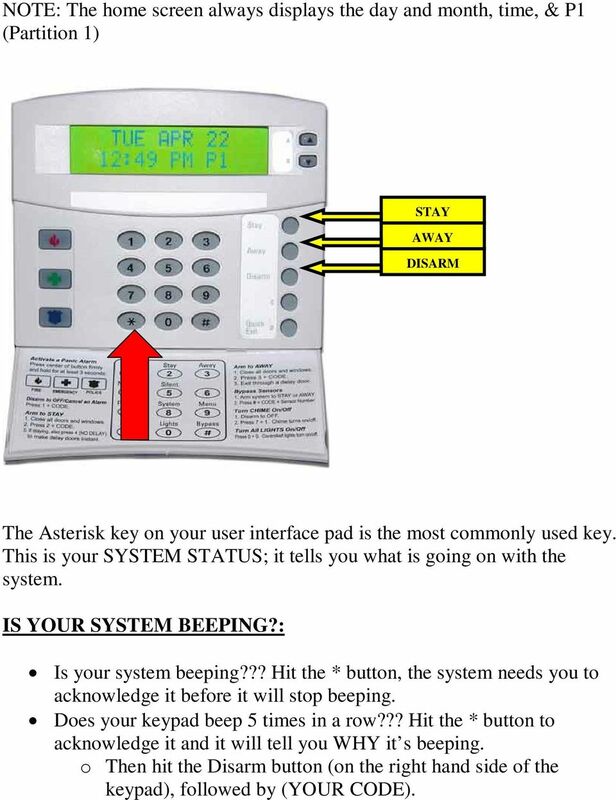 5 WHEN YOU HAVE AN ALARM, AND YOU WANT TO DISARM: Hit disarm followed by (YOUR CODE) Let the system disarm your user interface pad will display what s called an Alarm Memory display of the sensor that went into alarm Now, hit the * (asterisk) button. Now the alarm memory should be cleared, and the next time you hit the * (asterisk) button, it should say System is Ok (Providing all doors and windows are closed, etc). 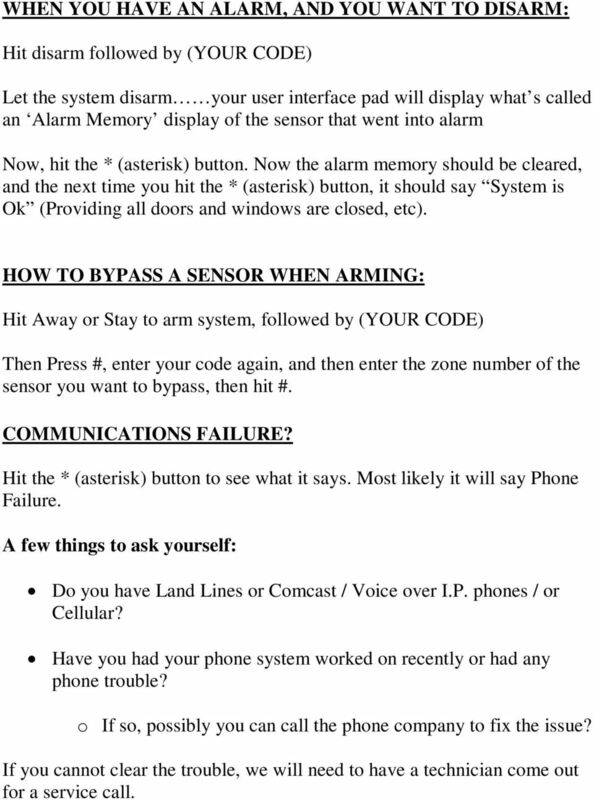 HOW TO BYPASS A SENSOR WHEN ARMING: Hit Away or Stay to arm system, followed by (YOUR CODE) Then Press #, enter your code again, and then enter the zone number of the sensor you want to bypass, then hit #. COMMUNICATIONS FAILURE? Hit the * (asterisk) button to see what it says. Most likely it will say Phone Failure. A few things to ask yourself: Do you have Land Lines or Comcast / Voice over I.P. phones / or Cellular? Have you had your phone system worked on recently or had any phone trouble? o If so, possibly you can call the phone company to fix the issue? 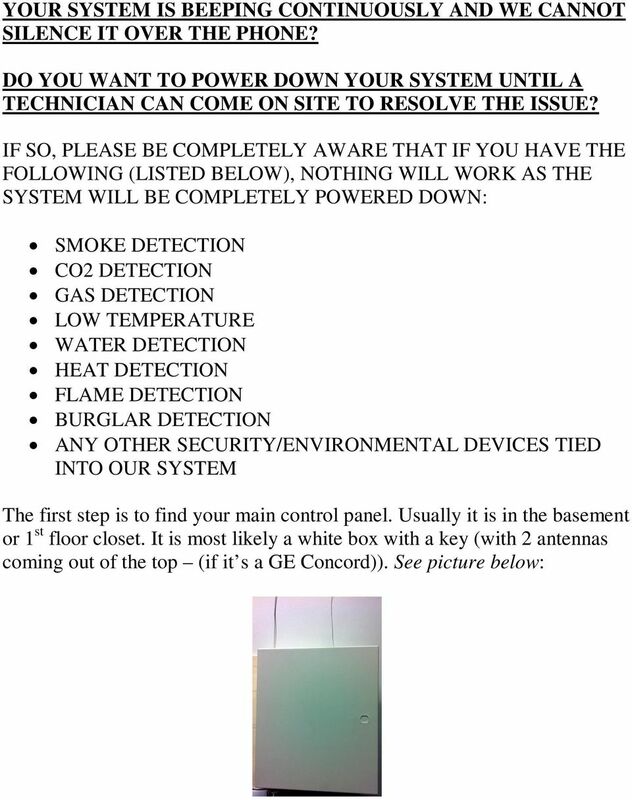 If you cannot clear the trouble, we will need to have a technician come out for a service call. 7 Once you find the panel, if the key is not in the lock, check on top of the box. 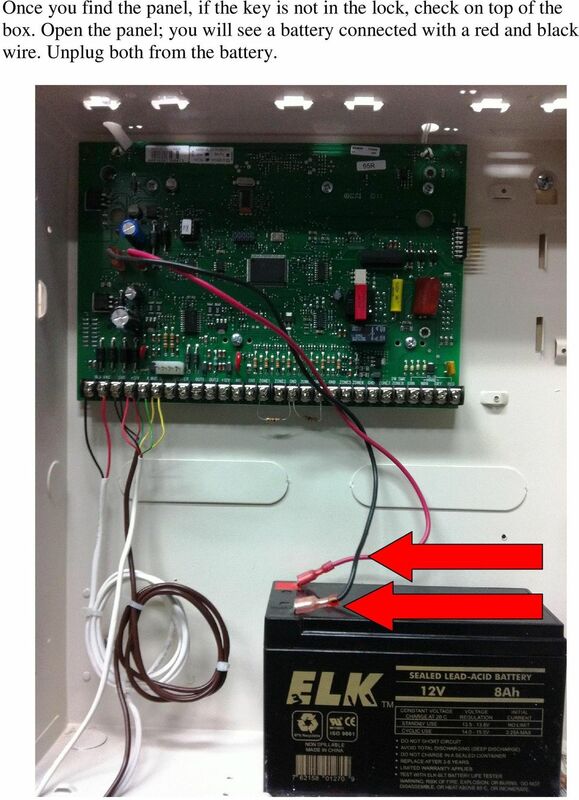 Open the panel; you will see a battery connected with a red and black wire. Unplug both from the battery. 8 The last step is to find the transformer (plugged into an electrical outlet) that is powering the system with AC power. The transformer will most likely be somewhere in the basement or next to the panel. (See picture below) Note: it is most likely screwed into the outlet and you will need a screwdriver to unscrew it and unplug it. If you have multiple transformers and are unsure which one it is.try to follow the wire from the transformer and see if it goes back to your security panel. 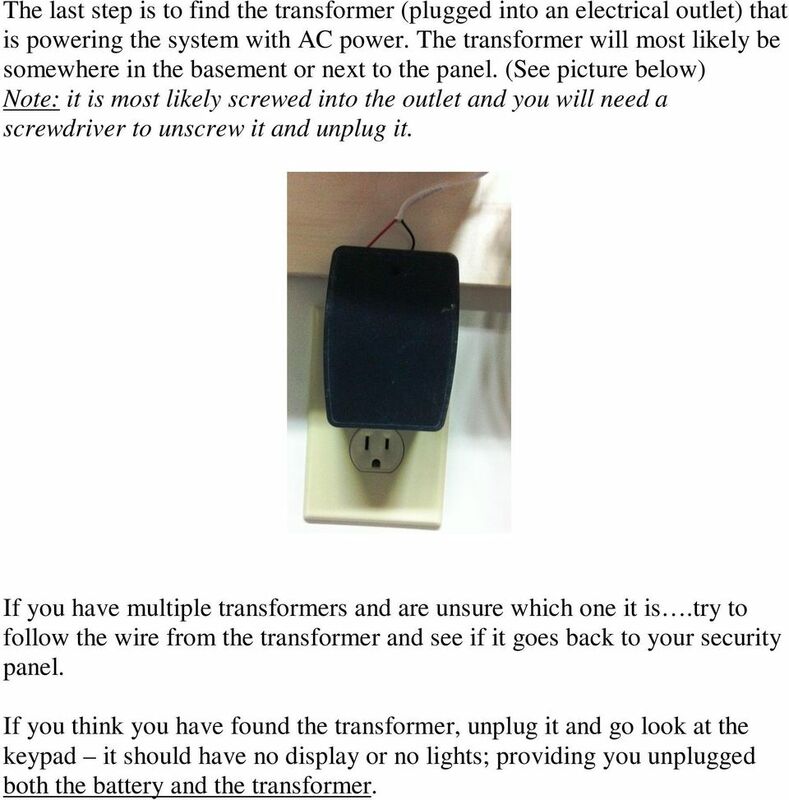 If you think you have found the transformer, unplug it and go look at the keypad it should have no display or no lights; providing you unplugged both the battery and the transformer. 9 Changing Your User Codes Changing regular user codes: Press 9 Enter your Master User Code You are now in the System Menu You will see Time and Date displayed Press B once (to scroll down) You will see User Codes displayed Press # to select You will see Regular User Codes displayed (These are the codes for everyone BUT you) Press # to select You will see User 000 displayed Press # to select, If you see 000-***** the stars mean there is NO CODE programmed here. 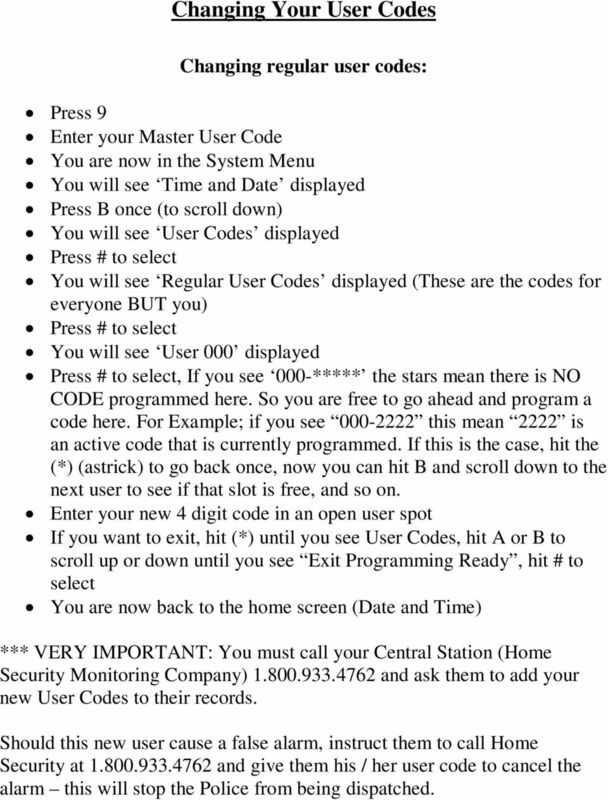 So you are free to go ahead and program a code here. For Example; if you see this mean 2222 is an active code that is currently programmed. If this is the case, hit the (*) (astrick) to go back once, now you can hit B and scroll down to the next user to see if that slot is free, and so on. 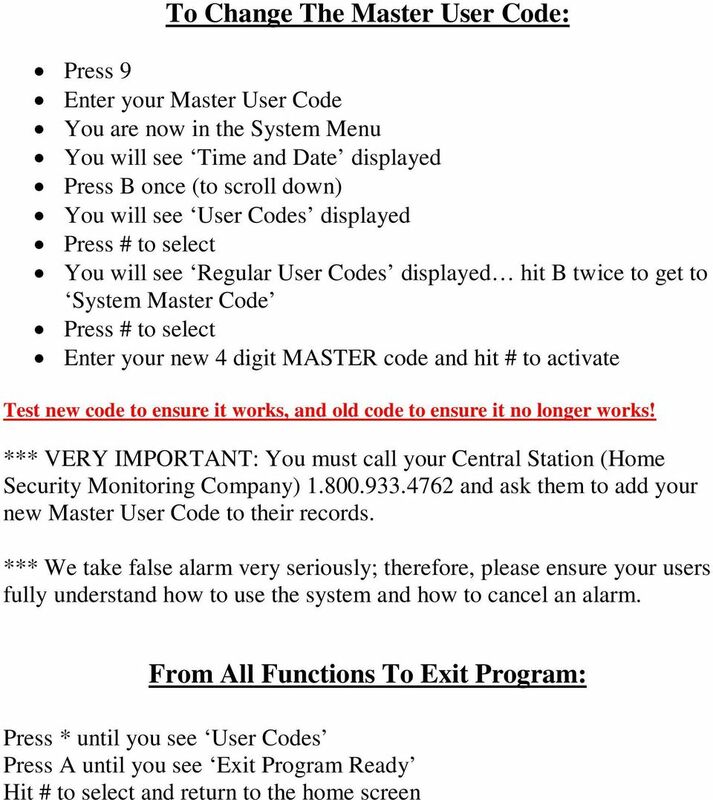 Enter your new 4 digit code in an open user spot If you want to exit, hit (*) until you see User Codes, hit A or B to scroll up or down until you see Exit Programming Ready, hit # to select You are now back to the home screen (Date and Time) *** VERY IMPORTANT: You must call your Central Station (Home Security Monitoring Company) and ask them to add your new User Codes to their records. Should this new user cause a false alarm, instruct them to call Home Security at and give them his / her user code to cancel the alarm this will stop the Police from being dispatched. 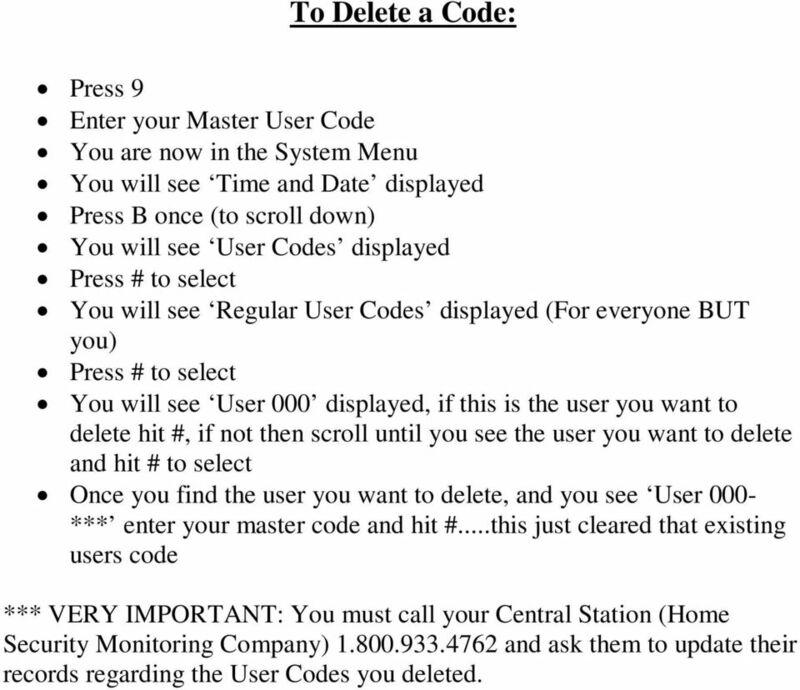 10 To Delete a Code: Press 9 Enter your Master User Code You are now in the System Menu You will see Time and Date displayed Press B once (to scroll down) You will see User Codes displayed Press # to select You will see Regular User Codes displayed (For everyone BUT you) Press # to select You will see User 000 displayed, if this is the user you want to delete hit #, if not then scroll until you see the user you want to delete and hit # to select Once you find the user you want to delete, and you see User 000- *** enter your master code and hit #...this just cleared that existing users code *** VERY IMPORTANT: You must call your Central Station (Home Security Monitoring Company) and ask them to update their records regarding the User Codes you deleted. AMPS Information. The keypad pictures listed here may vary from your panel type. 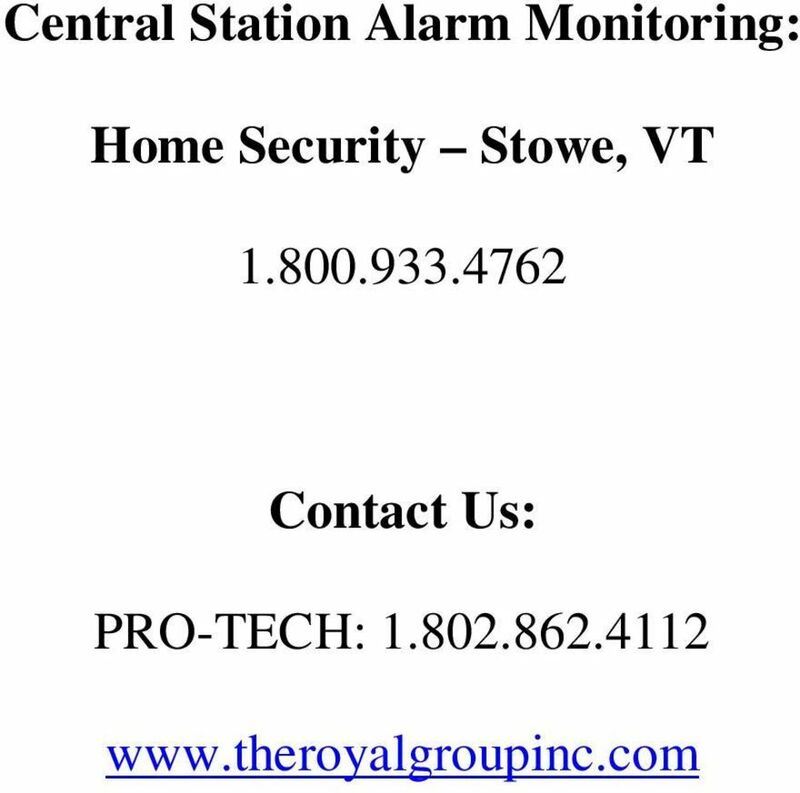 AMPS Information General Notes: The communication of your ADT Alarm System may be impacted as a result of the recent FCC ruling allowing phone / cellular service providers to switch to a digital only format. Home Automation, Inc. 1 INTRODUCTION Thank you for purchasing your new Omni automation system. You are about to enjoy a new feeling of security, peace of mind, and convenience. We at Home Automation, Inc.
Simon XTi User Manual Simon XTi P/N 466-2452 REV A 15MAR12 Copyright Trademarks and patents Manufacturer FCC compliance Contact information Customer support 2012 UTC Fire & Security. All rights reserved. Protection for everything you ve worked so hard to build.